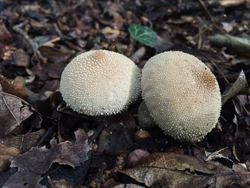 All true puffballs found in the UK are edible when young. They grow almost all year round and can often be found in large quantities. With a little care they are easy to identify. Some of them are very tasty! The safest of all UK mushrooms to identify is also the best tasting in the puffball family, the Giant Puffball, Calvatia gigantia. 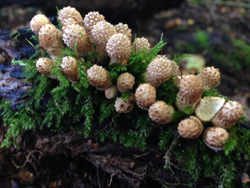 It has no lookalikes when mature, and can provide a large amount of food in just one mushroom. An average Giant Puffball can produce seven trillion spores. These spores are very fussy and the mushroom is lucky if more than 1 of them grows to maturity. This is quite lucky for us too as it has been calculated that if each spore from one mushroom germinated and the same happened to that generation it would produce a mass of fungi 800 times the volume of the earth! In 2010 Finley O’Neil a schoolboy from Yorkshire found a world record breaking Giant Puffball at 66.5 inches (nearly 170 cm) in diameter. 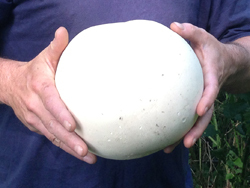 The Giant Puffball holds another record too; it produces more progeny than any other living thing. Calvatia gigantia roughly translates to giant bald head! Not all are easy to identify giants though; the family members range in size from less than a marble to bigger than a beach ball. There are roughly 18 members of the true Puffball family in the UK. 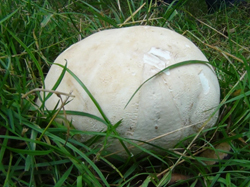 To identify that you have an edible puffball is quite simple. First find a mushroom with no gills, no spikes or no pores under the non existent cap! 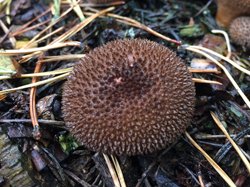 Basically find a mushroom that either looks like a ball or a ball with an elongated stem. For identification purposes the ball-like mushroom you have found must be cut in half. Inside, the mushroom should be pure white spongy flesh and nothing else. Young fresh edible puffballs have white spongy flesh all the way through the mushroom as shown on the right. 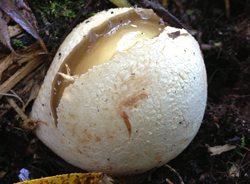 Once the flesh inside has started to yellow as the mushroom matures, it is no longer edible and can make people sick. If there is anything else apart from white sponge inside your mushroom then it is NOT an edible puffball. There are a few nasty lookalikes, but cutting the mushroom in half will determine whether you have one of them. 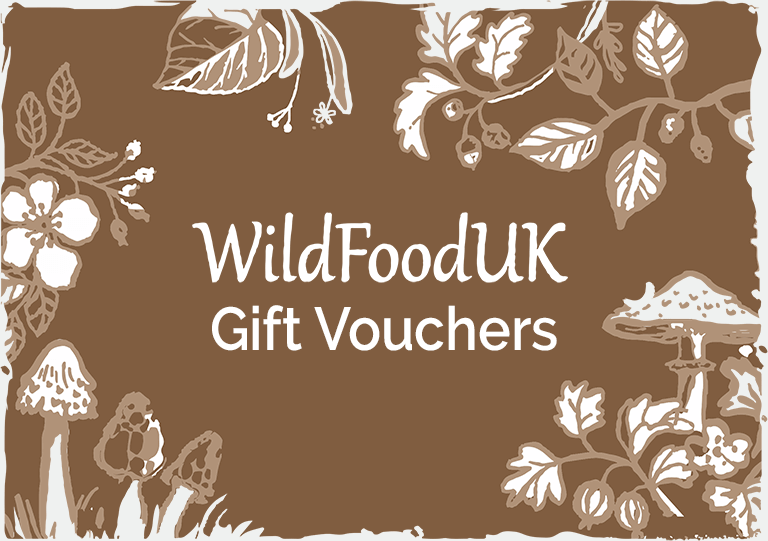 These mushrooms fool many people and account for the second most mushroom poisonings in the UK each year. 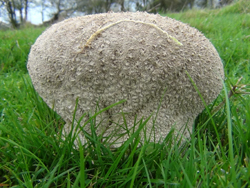 They are not deadly but can make you very ill.
Earthballs are easily identified though, as they have a tough warted skin, giving them their other common name ‘The Poison Pigskin Puffball’. They are also more solid to the touch and less spongy throughout. 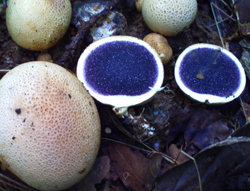 If cut in half almost all Earthballs are purple or black in the middle; this should put most people off eating them! Beware though, some species of Earthball can remain white in the middle, but they are still much firmer to the touch without the spongy effect inside and the skin will still be tough and warty. Remember: if you are unsure of what you have then the rule is always don’t eat it! Beware of the sometimes deadly Amanitas. 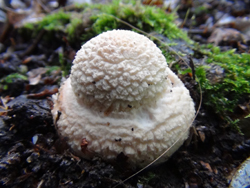 This family of mushrooms grow from a white ‘egg sack’ which can look very much like a puffball, as shown in the picture on the right. If cut in half, this egg sack would reveal a small mushroom ready to burst through the egg skin and start growing. Do not eat an Amanita Egg! Only some Amanitas are edible and these can only be identified when they are beyond the egg stage. Some Amanitas including the Death Cap and the Destroying Angel are deadly poisonous with no known cure. This mushroom also grows from an egg, but it is easily identified by the gelatinous layer between the mushroom inside and the skin of the egg (shown right). Some of the stinkhorn is actually edible if a little smelly, but if you are going to try this you have to be 100% sure that you do not have an Amanita instead! (Not pictured) Also grow from an egg and though they are listed as edible they are too similar to the Amanitas to be of any interest to a forager. We cook different puffballs in different ways. We use the large meadow puffballs (pictured right) and even larger giant puffballs to make puffball schnitzels. This simple method is the best way we have found of cooking them. The reason we make them into schnitzels is that these mushrooms have a lovely flavour, but when fried in large slices they shrink a lot and end up with a rather floppy texture. Basically the taste is great but the texture lets them down a bit. 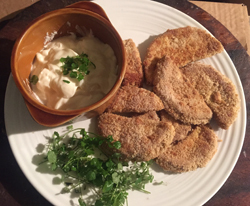 To get around this, make your puffball schnitzels by simply frying the slices of puffball in some butter and seasoning, then when sufficiently cooked take them off the heat to cool for a minute. A bit more about puffballs..
Puffballs play an important role in our environment as they are decay fungus, these help by being one of the only things that can decompose lignin, the tough part of wood. Without them our planet would be covered in wood and organic matter to quite a depth thatwould be very slow to break down. 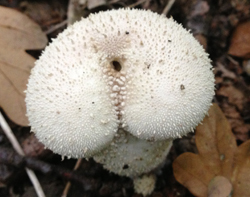 The spores of a puffball, if inhaled, can lead to Lycoperdonitis which causes inflammation of the alveoli in the lungs when inhaled in large quantities. This was discovered through an old nosebleed cure (I don’t know if while contracting Lycoperdonitis this can cure a nosebleed). Also in 1967 eight teenagers from Wisconsin snorted some Puffball spores looking for a high but ended up hospitalised for four weeks, it’s reported that the spores germinated to hyphae stage in the lungs and had to be treated with fungicide. There have been no human fatalities associated with Puffballs but dogs breathing in large amounts of spores have died. The spores have many sharp microscopic spines and can cause severe irritation of the lung and equally can be bad if you get the spores in your eyes. It’s not all bad with the spores though, smithies used to keep Puffballs in the forge to help heal burns or as a styptic to stop bleeding. It turns out they knew what they were doing as the spores are a good antibacterial, antifungal and antimicrobial, dealing with Bacillus subtilis, Staphylococcus aureus, Streptococcus pyogenes, Salmonella typhimurium, Escherichia coli and Pseudomonas aeruquinosa as effectively as the antibiotic ampicillin. 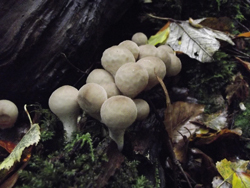 Puffballs are placed within the Basidiomycota group of fungus meaning the spores are on the inside, the old name gastromycete means ‘stomach fungi’. The fungus starts white throughout but when mature the interior turns yellow to purple to brown and becomes many millions of spores called a gleba with a paper thin skin holding them together. The mushrooms are then light enough to be blown around, spreading the spores, or rain drops can help as well. One raindrop hitting the mushroom can cause the spores to shoot out of the fungi at a velocity of about 100 cm/second to form a centimetre tall cloud one-hundredth of a second after impact. A single puff like this can release over a million spores in the Common Puffball, the spores being typically 3.5 to 4 microns in size.